Those crazy Dutch! Once you survived sinterklaas, Christmas and dodged the fireworks during new years eve you think you can finally relax. Well, guess again. 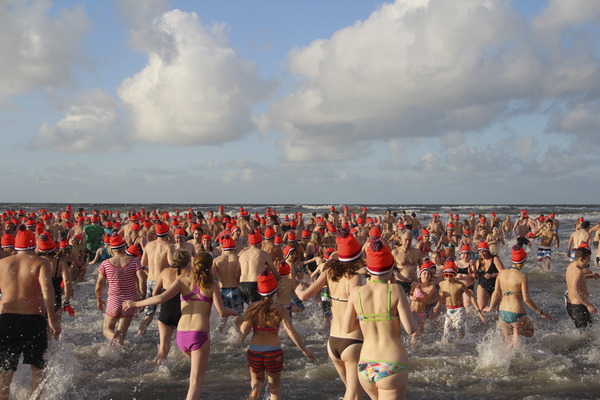 How the tradition started I don’t know but on the first of January masses off children, parents, elderly and mostly hangovered adults run in the the ice cold sea wearing nothing but their swinging gear and o yes a little orange hat made by a sausage company. When I mean masses I mean loads of milky white bodies running towards the sea like their life depends on it. Within seconds the same hurd runs back to their families who are standing by with dry towels and hot chocolate milk oh and a warm sausage. How the Dutch love their sausage! Would you like to experience this strange tradition? Come and join us for a warm cup of coco and glühwein on the first of January in Zandvoort at 12:00. For those of you who would actually like to join in the stampeed and plunge, just take off your clothes and put on an orange hat on. No one will know if you chicken out at the last moment; just make sure to hide that orange hat!